For the past 10 years, TOKY has been proud to support Food Outreach as a sponsor of A Tasteful Affair, the organization’s annual fundraising event. As the event’s official design partner, we’ve been able to create unique branding to truly reflect the fun and festive (and often themed) mood of the afternoon. 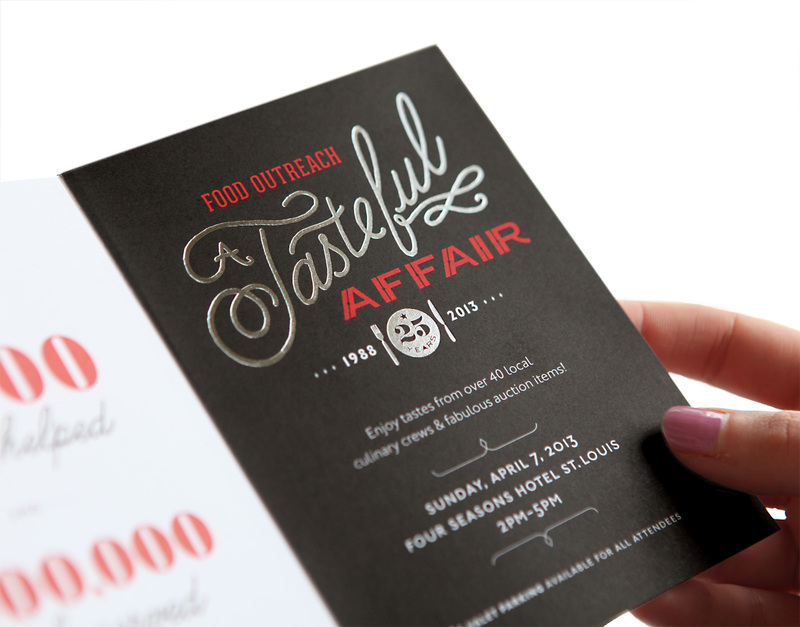 A Tasteful Affair is a party for those who support Food Outreach, but more importantly, it celebrates their mission to provide nutritional support to enhance the quality of life of men, women, and children living with HIV/AIDS or cancer. To celebrate the organization’s 25th anniversary, we started with the tagline “it’s time to bring out our good silver.” That would be the base from which to create the visuals, and it would be the connective string throughout all the event’s collateral. It was a nod to their work providing meals and also to the traditional 25th-anniversary gift. 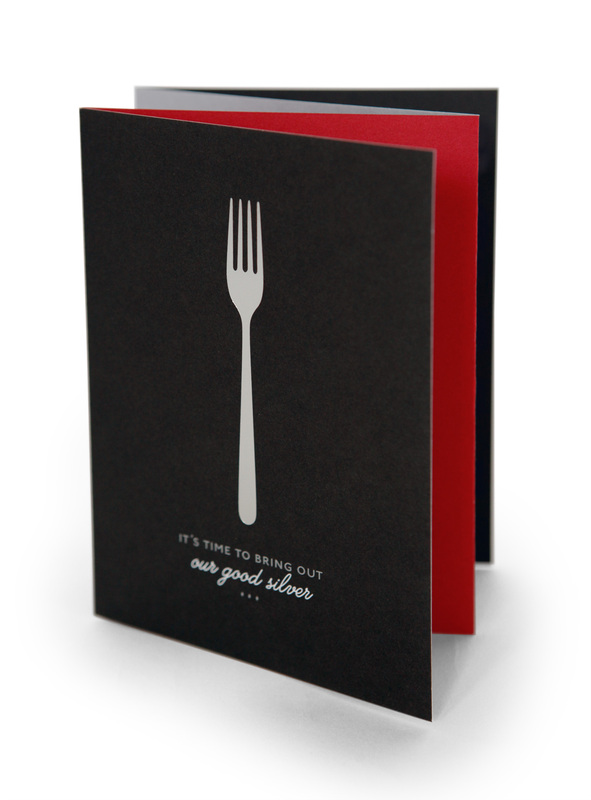 Foiled elements and silver metallic ink elevated a simple accordion fold invitation. This year TOKY wanted to go above and beyond a well-designed invitation set. 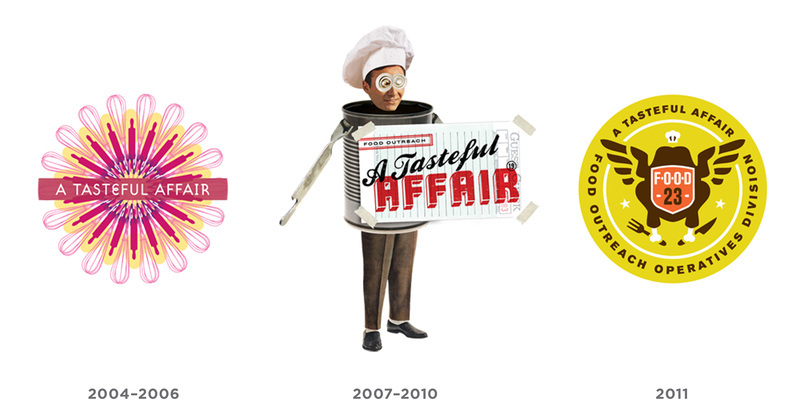 Our goal was to pay homage to the extraordinary work done by making the organization’s efforts visual. So we planned, designed, and installed a physical piece to be featured at the event, held this year at the Four Seasons. Using more than 6,000 forks (each representing two of the 12,000 clients served), we created a glittering wall of silver near the entry. 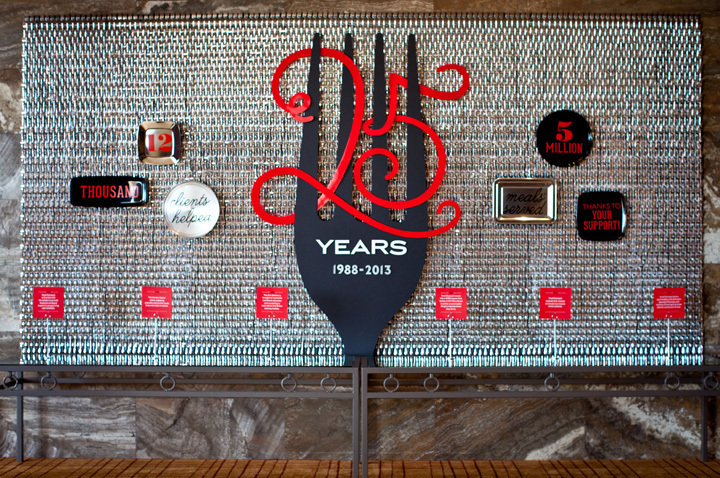 It was finished by black and silver platters with the messages of how many people have been impacted by Food Outreach, and a timeline of the organization’s achievements throughout the past 25 years. This was a great project for our team. It was a challenge to translate a message into something very physical — a challenge we enjoyed. It was a lesson in logistics, and, best of all, a chance to work with our hands. We’ve been proud to help bring awareness to Food Outreach over the years, and we congratulate them on this milestone in their organization’s history.